Discounts for longer hires... Up to 20% off!! Tow with a 2wd sedan or 4X4 the van packs down neatly low wind resistance and light weight makes for easy economical towing. Pops up to provide plenty of accommodation for a family. 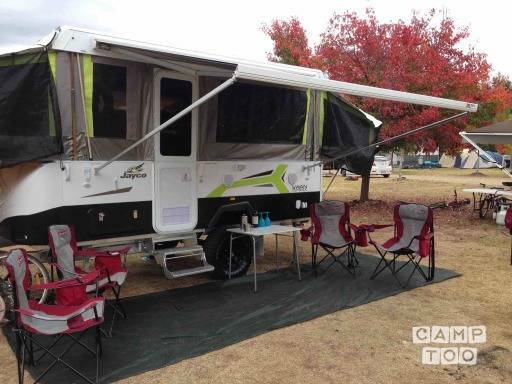 If you are stepping up from a tent or tent trailer you will appreciate that everyone lives and sleeps off the ground away from damp and critters, if the weather turns it won't spoil your holiday, there is a big club lounge and plenty of room to lounge about and brake out the board games! Unlike a traditional caravan, there are loads of windows, the whole top half of the van can be opened up to create a screen room effect so its light filled and breezy, there are curtains for privacy. Everything is in the van for comfortable camping on or off grid, all you need to bring is your linen. Full handover and insurance included in the rate. Contact me with your destination and dates for accurate rates and min seasonal hire periods. The kitchen includes 3-way fridge, gas oven, sink all your cooking needs and crockery provided. Other items available include separate hot shower and tent, Waeco fridge with battery and solar panel, Webber BBQ, pop up gazibo with walls and screen. Min hire fee 3Xthe nightly rate, longer min hire fees apply in peak periods, school holidays and long weekends. Je kan de caravan ophalen in Blackburn North bij Andrew.